One topic that I hear small businesses debate pretty often is how much time members of their team should spend trying to reach customer prospects through social networks. The fact is that many small companies rely on real-world referrals from existing customers for a majority of their new business. (More on that in a moment.) So, it makes sense to look at how social networks can amplify that trend. That motivation might be one reason to look at the updated version of Manta, an online community and marketing platform that is focused on small businesses. Manta has created a new platform within its community called Manta Social Connections, which lets small business-owners associate their profile their alma mater, places they’ve worked in the past, organizations appropriate for their business, and other important connections that could help build out their social reputation. They can also follow companies that might be of interest to their business; when someone “follows” a company, that fact is displayed on their profile. A survey of 1,069 small-business owners conducted by Manta found that 55 percent pointed to referrals from customers as the “biggest boost” to their business. Close to 80 percent of those surveyed had requested a recommendation from a former colleague or friend to help build those referrals. That’s the motivation behind another new feature within Manta, something called Manta Recommendations. 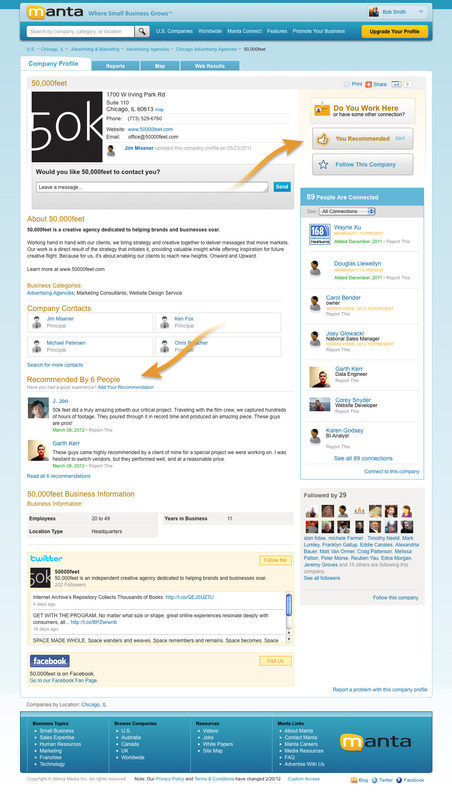 This feature allows small businesses to encourage their customers to recommend and promote small businesses. When a customer recommendation is published, it becomes available to the estimated 30 million people that visit the site on a monthly basis. Small-business owners have complete control over how these recommendations are displayed. They can add a Manta recommendation widget directly to the company Web site in order to collect recommendations there (as well as within the Manta community itself).